A person's injuries after a car accident depend on a number of factors. The speed of the vehicles involved, the position of the person in the vehicle, and the point of impact can all play a role. Head-on collisions tend to result in different types of injuries than rear-end collisions — although both types of accidents usually result in some kind of injury to the neck or back. A Lewisville auto accident lawyer who understands the mechanics of different types of car accidents will be better able to argue effectively for full and fair compensation. At Steele Law, P.C., our lead attorney has developed a strong knowledge of the physics involved in different types of car crashes and the firm retains an engineer on staff to assist with accident reconstruction. We have often been able to settle car accident cases in Texas for higher amounts because our knowledge of the mechanics of accidents allowed us to take a stronger negotiating position. Head-on collisions between two cars are among the most dangerous and deadly types of car accidents. Head-on car crashes often result in very serious injuries for both the driver and any passengers. 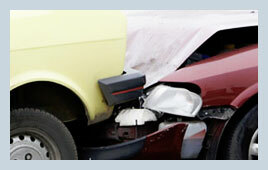 Head-on collisions are also almost always the result of negligence on the part of one or both drivers. Head-on collisions occur due to excessive speeding, going the wrong way on a one-way street or freeway entrance ramp, drunk driving, and falling asleep at the wheel, among other reasons. The physics of head-on car collisions result in specific types of injuries. Seatbelt restraints and the steering wheel can cause injury to the chest and ribcage. Serious head injuries are common, because the driver and passengers are likely to strike their heads against the dashboard or headrests. Serious cuts may occur from broken glass. When one car crashes into the back of another, the car in front speeds up abruptly and then suddenly slows down. This type of sudden acceleration-deceleration force often results in injuries to the neck or back. Depending on the initial speed of the vehicles and other factors, the injuries can range from moderate to severe. Moderate injuries after a rear-end collision can include whiplash, strained muscles, and concussions caused by the head striking the dashboard or the back of the headrest. When rear-end collisions occur at high speeds, the resulting damage to the victims' necks and backs can be much more serious, including closed head injuries and temporary or permanent paralysis. Injuries after either a head-on or rear-end car collision may be immediately apparent, but they may not appear until days after the accident. It is important for injured victims to seek immediate medical care and follow up with their doctors if new or different symptoms arise. At Steele Law, P.C., in Dallas-Fort Worth, our job is to concentrate on resolving your legal claim for compensation so you can focus on medical treatment and recovery. Contact our offices to schedule a free consultation. Lewisville Traffic Accident Attorney Disclaimer: The head on collision, rear end accident and auto accident information presented on this site should not be construed to be formal legal advice nor the formation of a lawyer or attorney client relationship. Any results portrayed here were dependent on the facts of a particular legal matter and results vary from case to case. Please contact a lawyer at Steele Law, P.C. for a consultation on your particular case.